My good friend got married in August, and I made this card for the happy couple. For something different, I decided to do a four panel card. 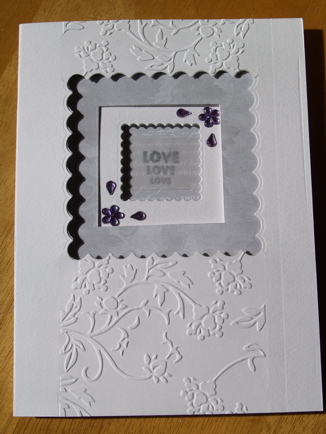 The first panel I die cut out a scalloped square, and embossed a section of the front. This is the embellishment I made with a few die cuts, flowers and a button. 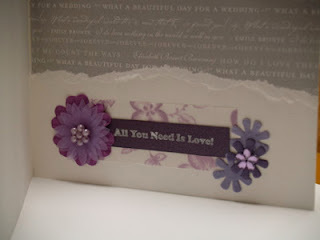 I also stamped another sentiment on, "love love love". 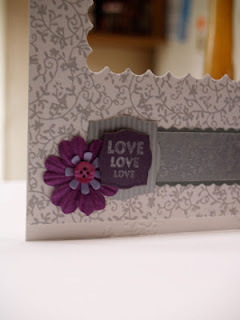 On to some vellum I stamped silver flowers and put them onto a grey scalloped strip for behind the embellishment. 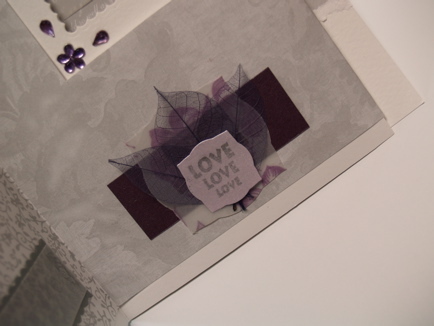 This second element I made again, from die cuts, printed vellum paper, and leaves. Again, I stamped the words "love love love". 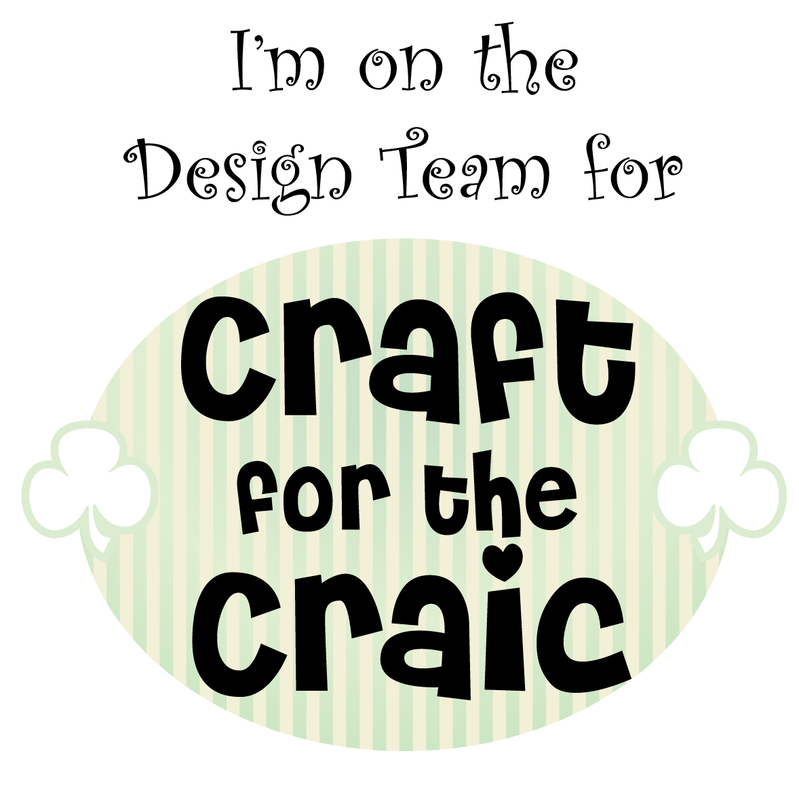 (carrying on from the song!) I covered this panel with a similar coloured paper to the first panel. Rather than a scalloped square, I cut out a plain square. 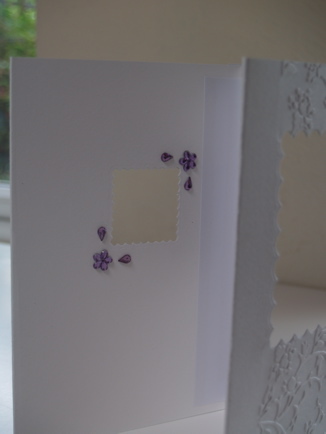 This is at the back of the card, but when the card is closed you see it. I added some gems to break the plain look! 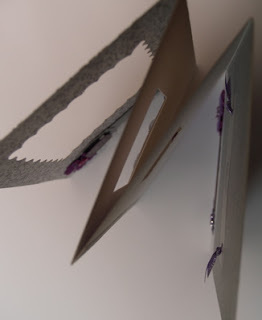 This is the view looking down on the card when it is standing up. The "love love love" here is printed in silver ink onto plain vellum. When the card is closed it can be seen through the different size cut outs. I used two brads to hold the vellum in place, and knotted ribbon through also. 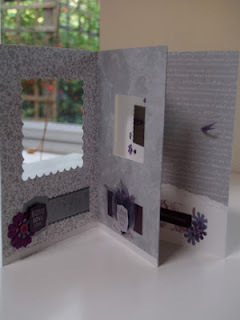 This is the last side of the card. 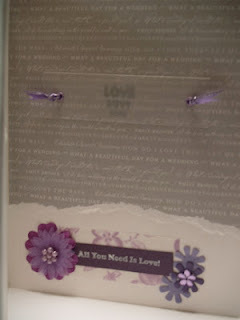 I used printed vellum, iridescent card, flowers, gems, beads etc. Thanks for looking, hope you have a great day. Fabulous project with loads of wonderful detail. Thanks for sharing with us at Stamp-N-Doodle!